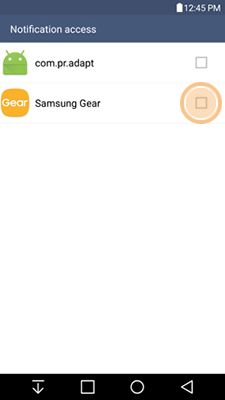 Connect your Samsung Gear S3 to your non-Samsung Android phone using the Samsung Gear app. 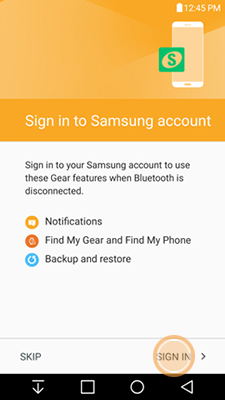 The Samsung Gear app must be installed on your phone before you can connect. 2.Turn on your Gear S3 by pressing and holding the Home key until the screen turns on. 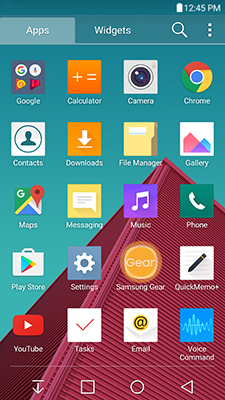 3.From the Home screen of your phone, touch the Apps icon. 6. 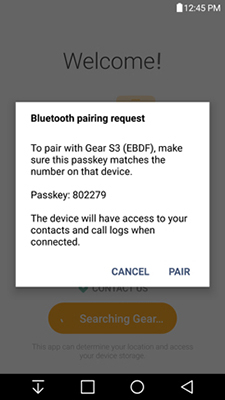 Touch PAIR to confirm the Bluetooth pairing request. 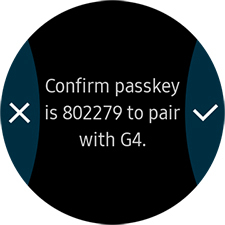 7.On your Gear S3, confirm the passkey matches the one on your phone. Touch the check mark to confirm. 8.Prompt will appear to install additional apps to improve your user experience. Touch CANCEL to skip this step, or touch OK to download an app. 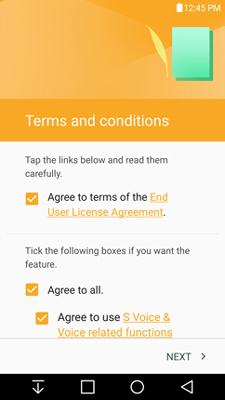 10.Review the End User License Agreement, and mark the checkbox to accept the terms and conditions. Mark the Agree to all checkbox to agree to the additional terms. Then touch NEXT. 11.Review the Samsung account information. Touch SIGN IN to create or sign into your Samsung account. 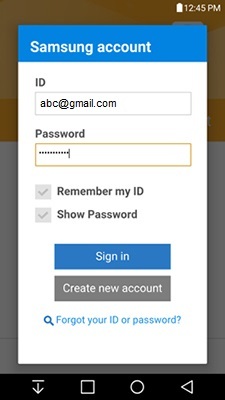 12.Enter your ID and Password information, and then touch Sign in. 13.Touch OK to turn off battery optimization for the Samsung Gear app. 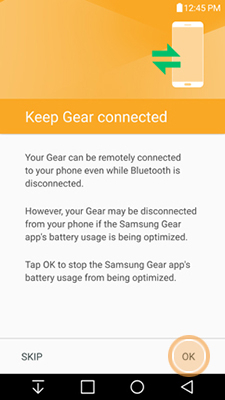 Touch SKIP to leave battery optimization turned on for the app, but this may cause the Gear S3 and your phone to disconnect. 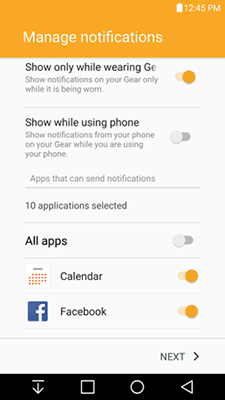 14.Review the notification access information and touch TURN ON. 15.Mark the checkbox next to Samsung Gear. 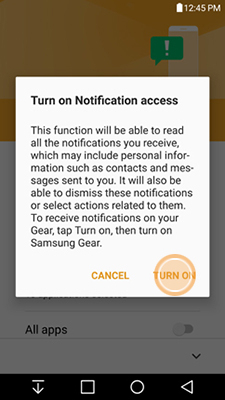 16.Review the Enable Samsung Gear information and touch OK.
18.Scroll to and touch the sliders next to the notifications you want to receive on your Gear S3. 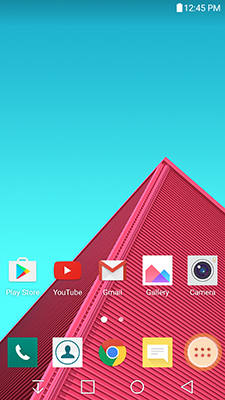 Touch the All apps slider to select all of the provided notification types. Touch NEXT to continue. 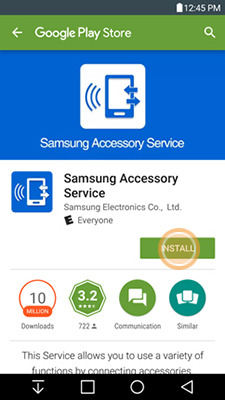 Samsung Gear app is now ready for you to use.